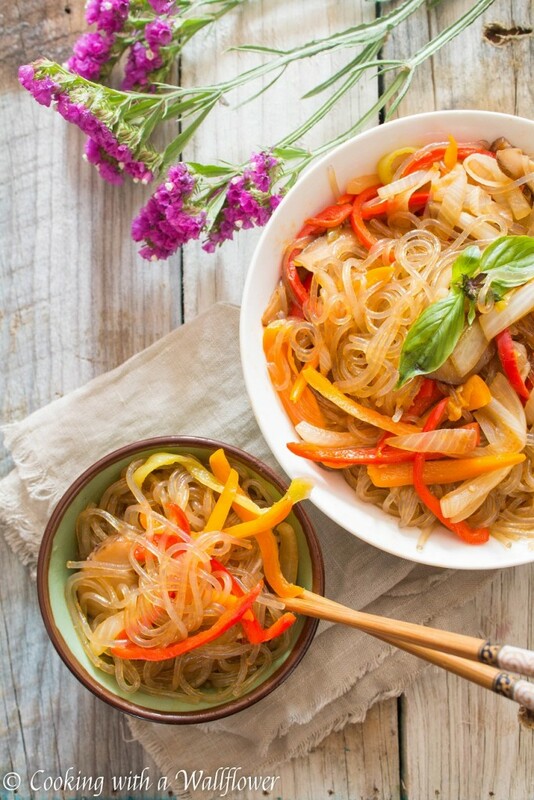 Korean glass noodles stir fried with sweet peppers and shiitake mushrooms in a slightly spicy sauce. These spicy Korean Glass Noodles with sweet peppers and shiitake mushrooms are delicious and perfect for a weeknight meal. Happy Monday! I hope you had a relaxing weekend and celebrated with a slice of cheesecake! I definitely did. It’s the perfect way to end July, right? 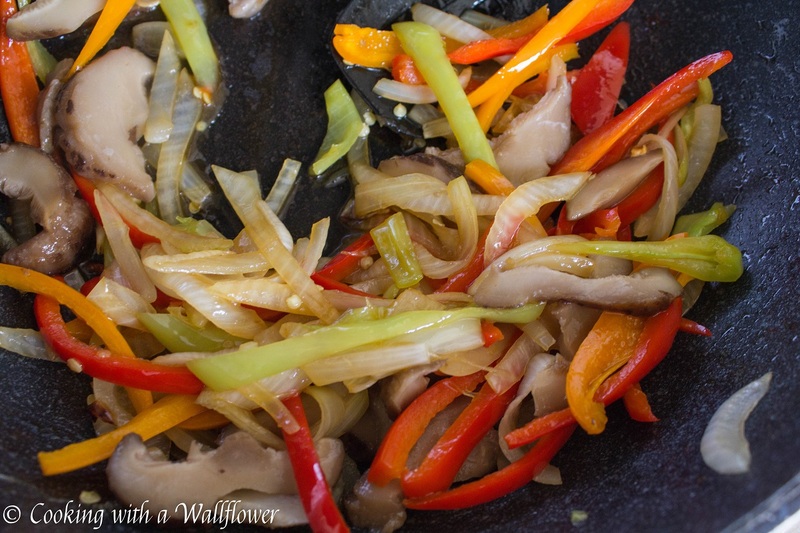 Today, I’m sharing with you one of my favorite dishes: a variation of japchae. 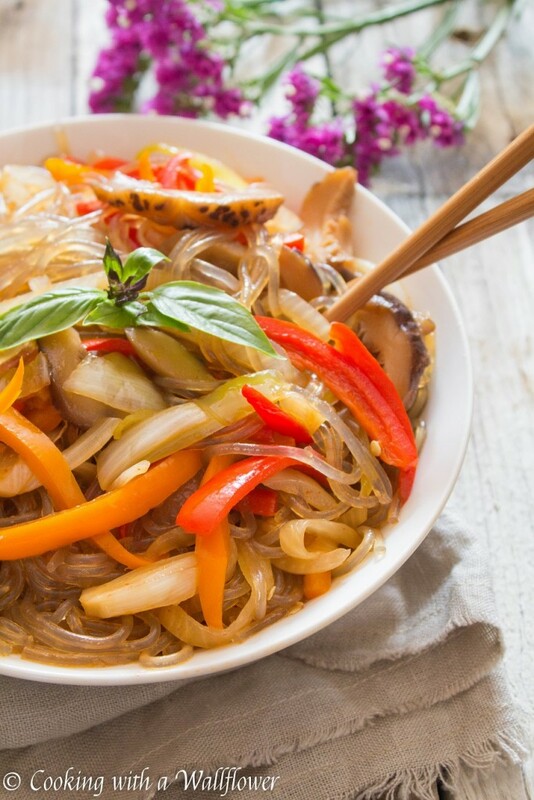 Japchae is Korean glass noodles made of sweet potatoes usually stir fried with vegetables and thinly sliced beef in a sesame soy sauce. Sometimes it’s served as a main dish, and other times it’s served as banchan, the little side dishes that are usually served at the beginning of your meal. I always look forward to those little side dishes. 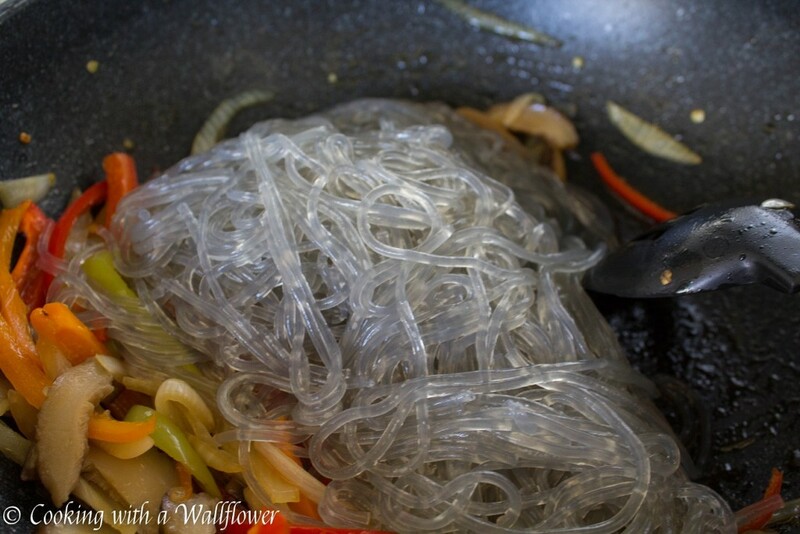 These Korean glass noodles I love the aromatic taste of sesame oil in the noodles. It adds such depth to an otherwise simple dish. This dish is my version of the classic japchae. Filled with thinly sliced sweet peppers and shiitake mushrooms, these spicy Korean glass noodles can be made in less than 30 minutes and utilize the ingredients that can be found in your kitchen. There’s no need to run out to buy more ingredients. You can add spinach, shredded carrots, mushrooms of all sorts. It’s really up to you how you customize this dish. I kept mine vegetarian and on the simple side. Cook the potato noodles as indicated on the packaging, about 6-8 minutes. Drain the noodles, run them through cold water, and set aside for now. Prepare the sweet peppers and fresh shiitake mushrooms. 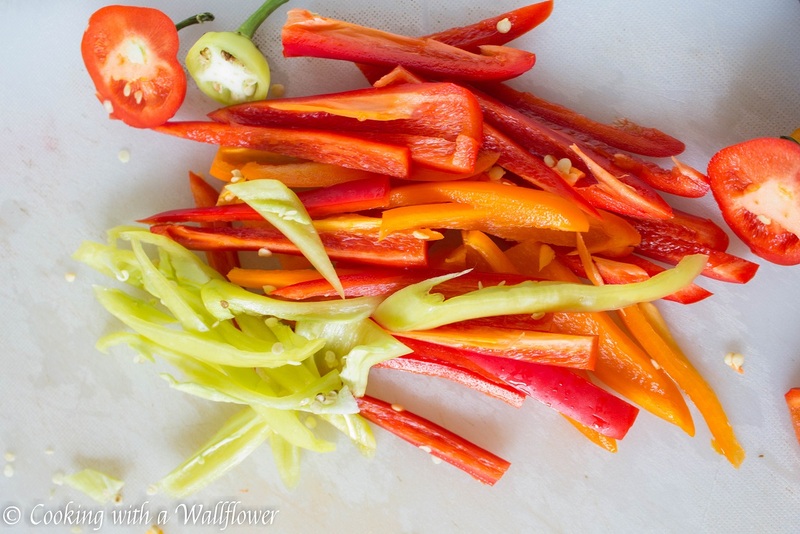 I used sweet peppers in red, yellow, and orange, which are about the size of jalapenos. But you can use a medium sized bell pepper instead. If you like a variation in colors, like I do, you can use half of two different bell peppers. I also used fresh shiitake mushrooms in this recipe, but you can soak dried shiitake mushrooms in water until they’ve softened or use any sort of mushrooms that you like as a substitute. Add a little bit of olive oil to a large skillet. Allow the oil to heat for a minute before adding minced garlic and onions. Cook these until they start to brown. Next, add the sweet peppers to the skillet. Cook until the sweet peppers become soft and tender to your liking. Drizzle a little soy sauce, honey, and sesame oil over the sweet peppers. Add mushrooms and cook until softened. I like adding the sauce to the vegetables to add more flavor to them. Remove the skillet from heat. Now, add the glass noodles to the skillet. In a medium bowl, whisk together soy sauce, honey, Sriracha sauce, and sesame oil. Pour the sauce over the glass noodles and toss to evenly combine all the ingredients. You want the sauce to evenly coat the noodles and vegetables. 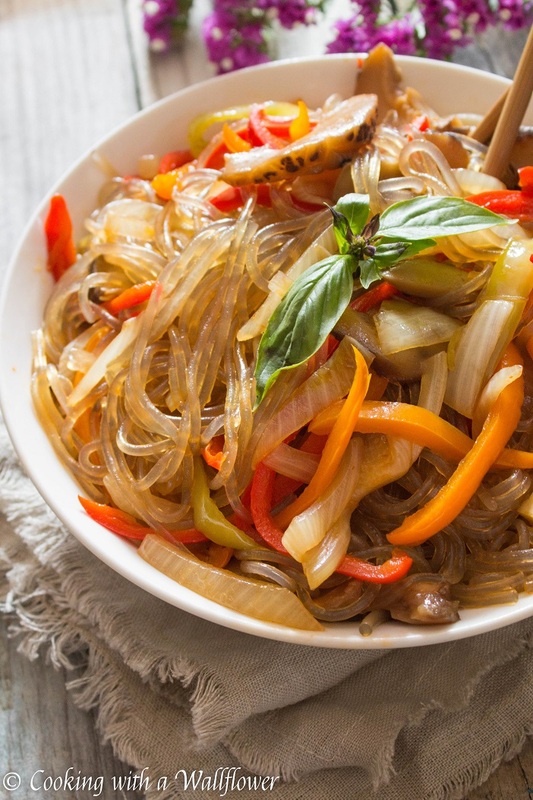 Serve this spicy Korean glass noodles with sweet peppers and shiitake mushrooms cold. If you like, you can garnish with toasted sesame seeds and basil leaves. 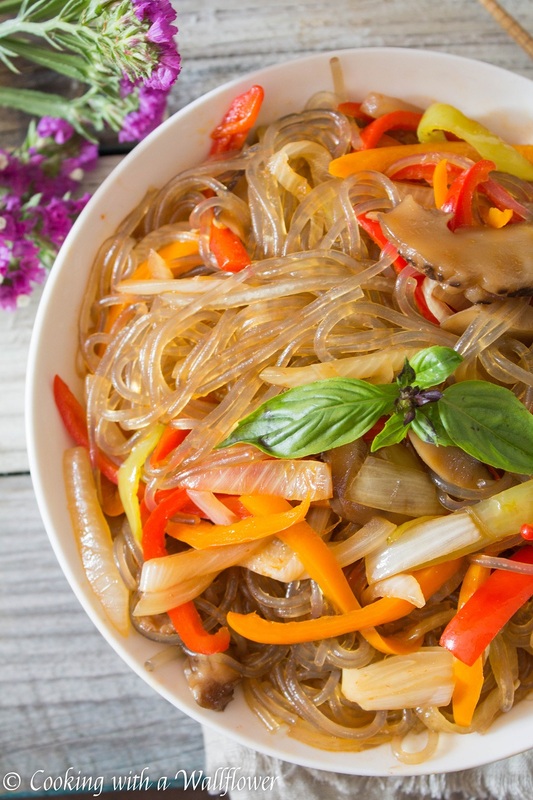 Korean glass noodles stir fried with sweet peppers and shiitake mushrooms in a slightly spicy sauce. This spicy Korean Glass Noodles with sweet peppers and shiitake mushrooms are delicious and perfect for a weeknight meal. Prepare the garlic, onion, sweet peppers, and fresh shiitake mushrooms. Next, add the sweet peppers to the skillet. Cook until the sweet peppers become soft and tender to your liking. Drizzle a little soy sauce, honey, and sesame oil over the sweet peppers. Add mushrooms and cook until softened. 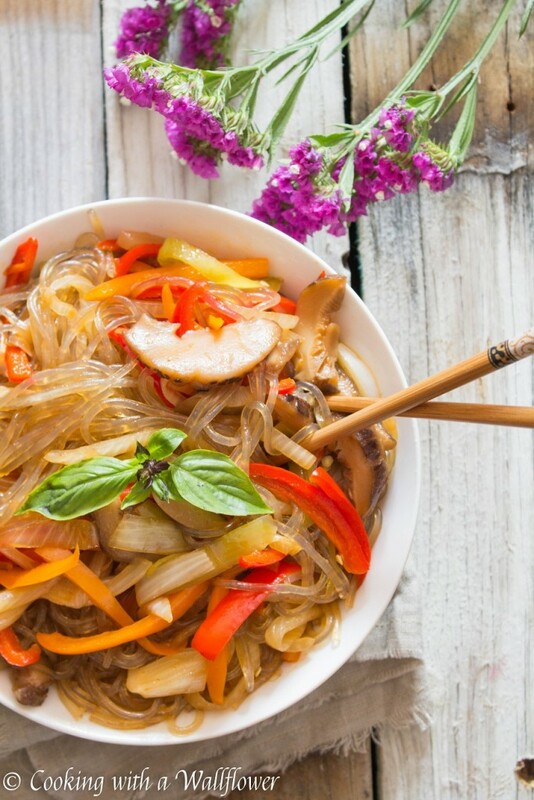 Serve the spicy Korean glass noodles with sweet peppers and shiitake mushrooms cold. Garnish with toasted sesame seeds and basil leaves, if desired. 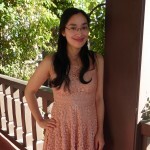 This entry was posted in Asian Inspired, Entree, Farmer's Market, Gluten Free, Quick and Easy, Recipes, Sides, Vegetarian and tagged Asian Inspired, gluten free, noodles, quick and easy, vegetarian. Your jap chae looks amazing! Definitely craving a plate of noodles now! That looks delicious. I just bought some glass noodles so this will be on the menu very soon. I had never heard of japchae until now. Very interesting. I have to try these noodles. Do they taste sweet? I love the way you have put this recipe together. You have made a simple dish look so exotic, Anrea! Thanks for bringing it to Fiesta Friday! I personally don’t think they’re sweet. But they are definitely chewy. Nice, thanks for sharing. 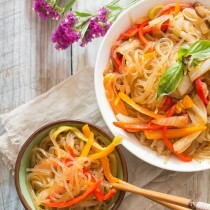 I have been wondering about whether or not glass noodles are glutenfree! I am so excited to try this! I can’t ever find glass noodles in my town, but someone just told me I can order them from Amazon! I’m so glad you found them! Hope you’ll like this dish! I always get hungry when I see your post. It looks so delicious .